Deliver on Best Practice Climate Action—Contribute to the Paris Climate Agreement through climate finance by purchasing Verified Emission Reductions from projects that also deliver sustainable development benefits, and gain recognition by organisations like CDP and WWF. Make an impact toward SDG priorities—Fund verified specific SDG impacts from high-impact projects or verify the SDG impacts of your supply chain interventions. Then use these to credibly report on shared value or meet “Net-Positive” goals. Gain recognition by civil society which is increasingly calling for accountability for an organisation's full carbon footprint as part of Best Practice Corporate Climate Action. NOTE: In the future, as the Paris Climate Agreement’s nationally determined contributions (NDCs) come into force, Gold Standard will also offer Certified Emission Reduction Statements to allow for organisations to fund emission reductions in places that need climate finance but do not or cannot participate in carbon trading schemes. Why choose Gold Standard over other standards in carbon markets? This rigour translates into greater value. In fact, Gold Standard climate protection projects deliver between $21 and $177 in additional value toward the SDGs for every tonne of CO2 mitigated. 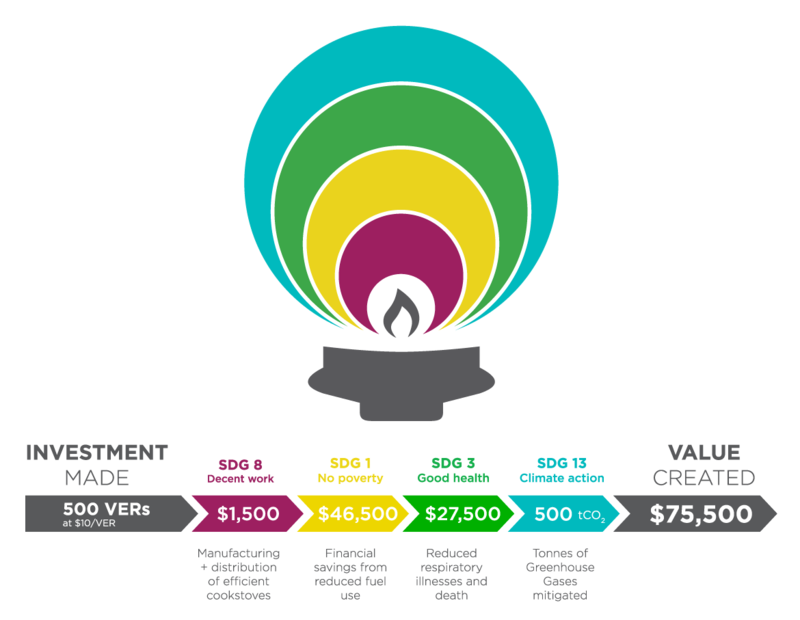 See a visual summary of the environmental and social value created from clean cookstove projects in the image below. A sample project that delivers clean cooking technologies to communities that previously had cooked over open fire—posing health and safety risks to the family and contributing to local deforestation and habitat loss. Figures are based on funding 10,000 Verified Emission Reductions (VERs) at $5/VER. By purchasing Emission Reductions, you make a contribution to meeting the aims of the Paris Agreement as well as Sustainable Development Goal 13 by financing a direct and quantifiable impact on climate change mitigation that is monitored, verified and certified by Gold Standard. The purchase of these can be used to meet ‘carbon neutral,’ ‘climate neutral,’ and ‘climate positive’ claims. For credibility, companies should always first commit to ambitious internal emission reduction targets. Gold Standard recommends setting a Science Based Target. In your communications, you may also describe the contributions to other Sustainable Development Goals that the project you supported has also delivered. 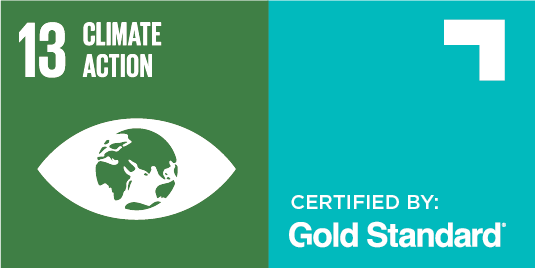 Gold Standard for the Global Goals is a next-generation standard designed to accelerate progress toward climate security and sustainable development. This standard enables initiatives to quantify, certify and maximise their impacts toward the Paris Agreement and the Sustainable Development Goals, with enhanced safeguards, holistic project design, management of trade-offs and local stakeholder engagement ensuring the highest levels of environmental and social integrity. What defines Gold Standard projects? Stakeholder inclusion. All projects are developed in line with best practice, following a process that is inclusive of affected stakeholders and ensuring their objectives and concerns are represented. Safeguard management. All projects are developed in line with best practice, following rigorous safeguards to prevent unintended consequences and manage trade-offs where needed. Multiple contributions to Global Goals. All projects contribute holistically to at least three Sustainable Development Goals (SDGs). All impacts are tracked according to robust monitoring plans, verified by an approved independent third party, and certified by Gold Standard. All projects may claim to be “gender sensitive.” Relevant projects may also claim to be “water sensitive." Transparency. Any and all Certified SDG Impacts or financial products issued from Gold Standard project activities are disclosed in a transparent, third-party registry. Civil society support. The process followed is endorsed by Gold Standard’s network of NGO supporters who can access and provide input to project reviews.